We've investigated, since that's what we do at the (Android) Police, and we have three working theories — that unfortunately all don't entirely add up. But bear with me, it's pretty interesting. As far as we know, there is one way to reliably activate dictionary sync again, but it's a solution that won't work for many of you. You need to revert to Gboard v6.0 or earlier (up to 4.1, where the feature was first introduced). Here, the sync option is back as though it never disappeared to begin with. 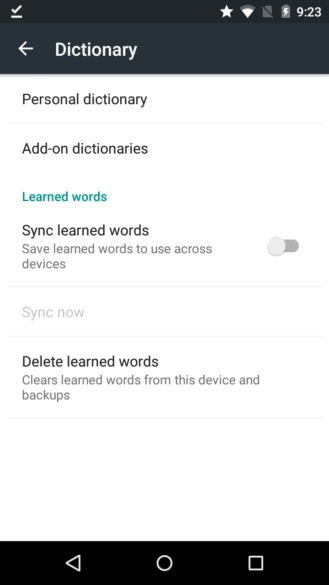 Then, when you upgrade to the latest version after activating sync, you get to hold on to it — but keep in mind that the updated app crashes once try to switch accounts, which is an indicator that dictionary syncing is on its way out. As you can judge from the old UI, this isn't a recent Android version I tested this on. And you're right: It's my old Moto X 2013, which doesn't have Gboard preinstalled, thus allowing me to install any version of the app. Many modern devices, most notably Pixel and Android One devices, have the keyboard bundled, so owners of these can't revert to earlier versions than the one their phone shipped with. Still, even this theory can't explain how it's possible that we have a tipster using Gboard beta version 8.1.4.241419472 with the sync option showing up while we have three other examples from the same and other 8.x versions that don't have the setting. Left: Version 8.1.4.241419472 with sync. Right: Exemplary version 8.0.4.236324529 without sync. G Suite and your personal account's dictionary sync don't play together nicely. We've known this for a long time, as you could potentially end up syncing confidential data from your G Suite account to other devices that don't have G Suite on them. 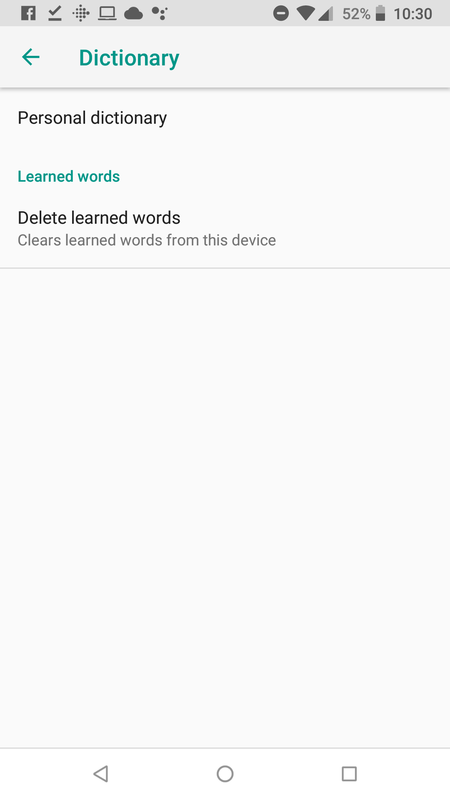 Since Gboard can't differentiate between work and personal words, the feature is disabled completely. 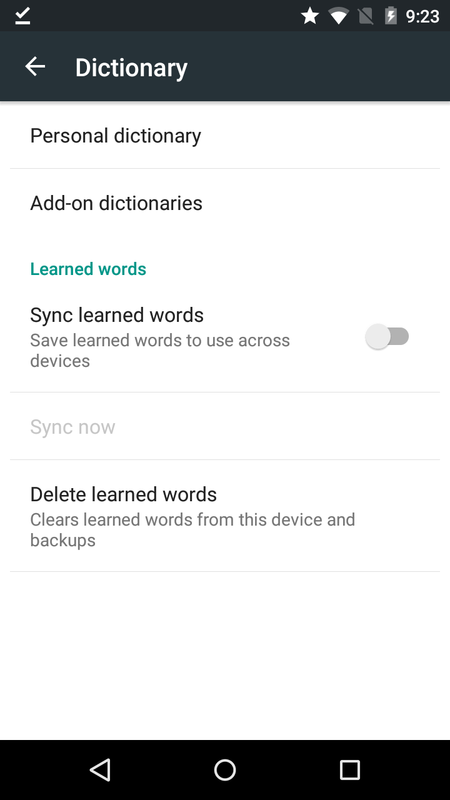 Something has changed though: previously, the option to sync dictionaries was just greyed out for G Suite users, and now it's gone altogether. 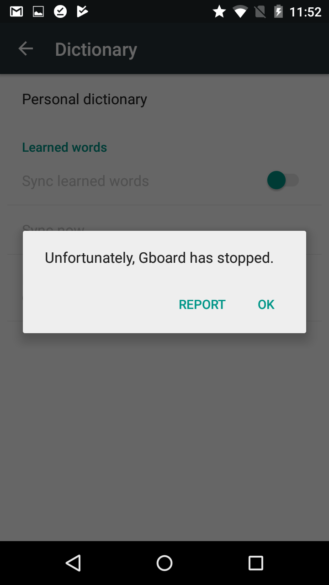 The same is true for devices with Samsung Secure Folder enabled — since Gboard doesn't know whether you're working on a file in that folder, you won't be able to turn on sync. But this isn't consistent anymore. 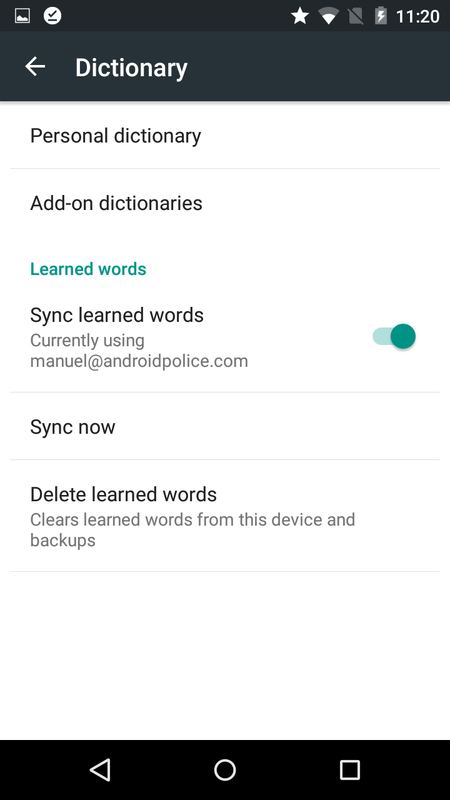 When I added G Suite to my Moto X, it still allowed me to sync dictionaries — I could even choose whether I wanted to use my personal or my work account, and syncing with my G Suite address actually worked. My colleague Scott could reproduce that on his phone, too. This behavior is odd, to say the least, if not a security issue, depending on where your company earns its money from and what you communicate about on your phone. However, to get back to the disappearing option itself, G Suite and Samsung Secure Folder can't be the only culprit here, since users without them are affected, too. This leaves us with another possible explanation: It's a bug. Reports of the feature disappearing started in early 2018. While most of those can be pinpointed to G Suite and Samsung Secure Folder issues, I've already explained that this can't possibly be the only culprit. We have contradicting information on this problem, so I guess that something must be botched at Google's back end — or the company is planning to phase out the option completely. Google has so many projects to maintain and heavily relies on server-side updates, making it hard to pinpoint a bug. But because of the sync-related crashes on the latest version, it seems that the feature is on its way out. Thankfully, Google already has some sort of replacement in the works: Our own Cody found a tool to export personal dictionaries in his latest Gboard APK Teardown.